On Monday, October 8, the Stern College for Women S. Daniel Abraham Honors Program welcomed Anne Neuberger, chief risk officer of the National Security Agency (NSA). 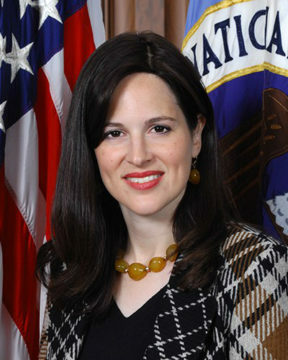 Neuberger, who is also a member of the Stern College Board of Overseers, spoke about how she left her career in finance to get involved in government, starting with a fellowship in the Department of Defense and eventually having this position created for her, making her the first chief risk officer the NSA has ever had. One student asked Neuberger how she is able to balance her religious life while being an Orthodox Jewish women in such a high government position. 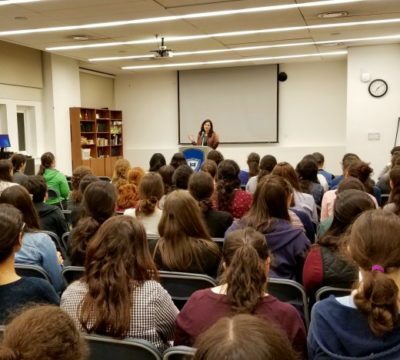 Neuberger explained that when she started working, it was uncomfortable, “but then I found that people were actually interested, so I started explaining the holidays.” Neuberger even made it a point this year to invite her colleagues over to see her sukkah, since most of them had never heard of Sukkot before they met her. She illustrated this point with a humorous story. At one point, having consistently been at work every day for 12 hours, her boss came up to her and said, “Anne, I’m feeling like its sundown on Friday and you have to go home.” She laughed because it was the middle of a day on a Wednesday, but his point, she said, was that everyone knows she works extremely hard during the week but must leave before sundown on Friday. Since her boss knew she was too diligent a worker to just voluntarily go home early on a weekday, he jokingly equated the Wednesday with a Friday in the hopes of getting her to take a break.